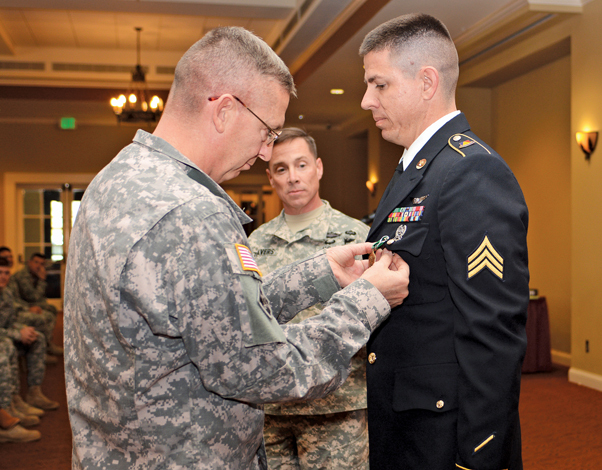 National Training Center and Fort Irwin Commander Maj. Gen. Ted Martin pins an Army Commendation Medal on the uniform of Sgt. Joseph Bailey, Non-commissioned Officer of the Year for fiscal year 2014 during a ceremony here, Jan. 12. Command Sgt. Maj. Stephen Travers (center) served as part of the official party for the event. The National Training Center and Fort Irwin conducted a quarterly military and civilian awards ceremony, Jan 12. The event awarded Soldiers and Department of the Army civilians for various achievements. The non-commissioned officer of the year, for fiscal year 2014, received an Army Commendation Medal. Four Soldiers and NCOs received Army Achievement Medals for winning boards in two quarters of fiscal year 2015. Civilians received length of service awards and employee of the year awards. Non-commissioned Officer of the Year for fiscal year 2014: Sgt. Joseph Bailey, Operations Group. Soldier of the Quarter, first quarter for FY 2015: Pfc. Milian Tabuso, B Company, 229th Aviation Regiment. Non-commissioned Officer of the Quarter, first quarter for FY 2015: Staff Sgt. Derek Stevenson, B Company, 229th Aviation Regiment. Soldier of the Quarter, second quarter for FY 2015: Pfc. Jonathan Tanner, B Company, 229th Aviation Regiment. Non-commissioned Officer of the Quarter, second quarter for FY 2015: Sgt. Jose Linares, S3 Operations, 1916th Support Battalion. Employee of the Year FY 2014, category 1: Anthony Wynn, United States Army Medical Department Activity. Employee of the Year FY 2014, category 2: Samantha Mendoza-Rodriguez, G4 NTC. Employee of the Year FY 2014, category 3: Jessaka Menzie, Office of the Staff Judge Advocate. Employee of the Fourth Quarter FY 2014, category 3: John Manser, OPS GRP. Length of Service award for 40 years of service: David Stoddard, G1 NTC. Length of Service award for 30 years of service: Dave Key, NTC Safety. Length of Service award for 25 years of service: Patricia Tyson, MEDDAC. Length of Service award for 25 years of service: Angela Turner, Fort Irwin United States Army Garrison. Length of Service award for 20 years of service: Eric McFarland, Fort Irwin USAG. The NTC and Fort Irwin Commander Maj. Gen. Ted Martin and Command Sgt. Maj. Stephen Travers served as the official party and presented medals and certificates. 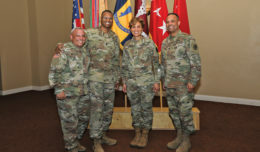 Soldiers and NCOs also received keepsakes and gifts from the Association of the United States Army, the Exchange, the Sergeant Audie Murphy Club, and Family, Morale, Welfare and Recreation. 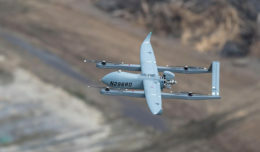 Martin expressed that it is important to understand the significance of the recognized individuals to the NTC team and its mission of training rotational units. The general asked the younger generation to take heed of the service by those being awarded. 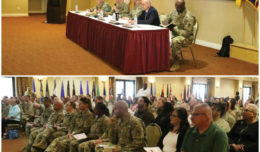 “Try to become what they are – great shining examples of both Department of the Army civilians, and Soldiers and non-commissioned officers – that’s what it takes,” Martin said. Bailey, a helicopter (AH-64 Apache and OH-58 Kiowa) repairman with Eagle Team, OPS GRP, competed in five boards to reach his milestone. He was excited and surprised to learn he won, and explained that the most challenging aspect of the process was getting over his nerves and focusing on the task. He recommends to junior Soldiers and NCOs that they participate in quarterly board competitions, because it helps with career progression – regardless of the outcome.